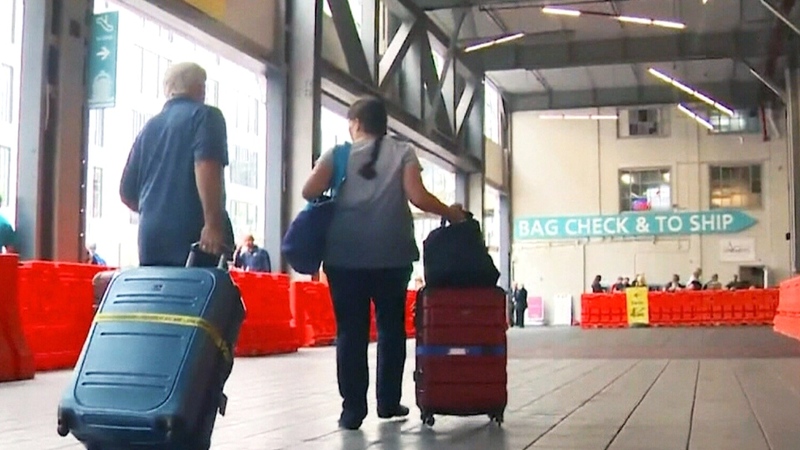 HALIFAX -- Vacationers who packed bathing suits for Bermuda instead bundled in sweaters as their cruise ship docked in Halifax on Sunday morning, their travel plans derailed by a burgeoning hurricane. 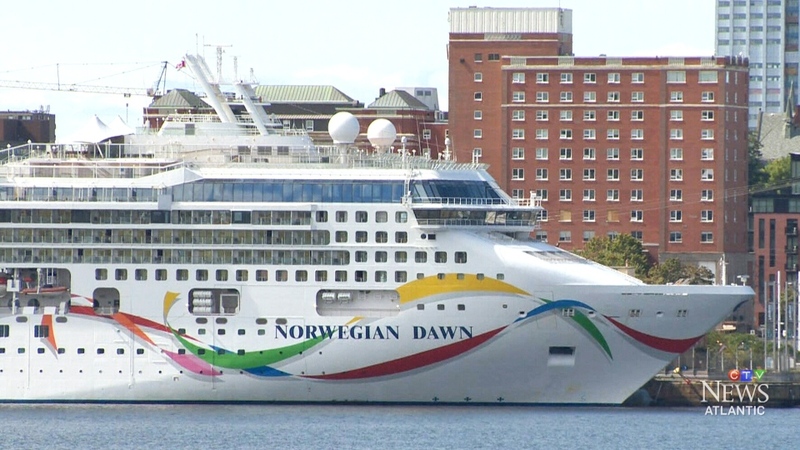 Norwegian Dawn, which has a guest capacity of 2,300, was originally supposed to spend seven days on a round trip from Boston to Bermuda, but it swept into Halifax on Sunday morning instead on its first stop in the Maritimes -- an itinerary change thanks to hurricane Florence. The ship will also visit Sydney, N.S., Saint John, N.B., and Bar Harbor, Maine, before heading back to Boston. It was a smidge above 10 degrees in Halifax -- compared to nearly 30 degrees in Bermuda -- when Cristi Legare got off the boat with her family at around 8 a.m. Speaking from the windy Halifax waterfront, Legare said Norwegian Cruise Line, which operates nearly 20 cruise ships, told her about the change at around 10 p.m. the night before it left Boston on Friday. "We didn't really get enough time to re-pack or anything, so it was frustrating, to say the least," said Legare of Lowell, Mass. "We understand why they did it, but we're all disappointed. It would've been better if it was another tropical destination, but going somewhere so far north when we were expecting sunny weather and beaches, it was a tough pill to take." Instead of white sand and palm trees, Atlantic Canadian beaches are more known for their rugged coastlines and chilly water. Complicating the issue is the fact that Legare's mother uses a wheelchair. "We like to plan ahead, and where we've been to Bermuda before, we planned everything, knowing what we can and can't do with my mom," she said. "Coming here, it's completely unknown. We're not even doing excursions because we don't know what's accessible for her." Legare said she inquired about a partial refund, but Norwegian Cruise Line told her passengers would not be compensated. A Canada and New England cruise costs several hundred dollars less than a Bermuda one, Legare said. The cruise line also changed the itinerary for another ship: originally scheduled to travel from New York to Bermuda, Norwegian Escape will instead dock in Florida and the Bahamas. In an emailed statement, the company said they reserve the right to cancel or change itineraries as needed without liability, and their guests are made aware of this stipulation and provided with their terms and conditions at the time of booking. "The safety and security of our guests and crew is always our top priority," they said. "While we recognize these itinerary changes may be disappointing, our on board teams are prepared to ensure the best vacation experience possible given these weather related necessary changes." Accommodating last-minute port calls during hurricane season isn't uncommon in Halifax, according to Halifax Port Authority spokesman Lane Farguson. "It's one of those things that happens a few times over the course of the season," he said. "It really depends on the situation and what the captain and the cruise line decide to do, and we will work accordingly to do our best to accommodate. He said the port can see upwards of five cruises on a busy day -- not counting for the smaller boats that make their way into the harbour. Farguson added that this year is on track to be one of their best seasons yet, with around 200 expected cruise vessel calls carrying around 300,000 total guests. "Halifax is a destination for cruises because of the great tourism offerings that are there," he said. "It's a very walkable, tourist-friendly waterfront, and the businesses that cater to cruises really do extend that season into September and October." Despite the crisp morning weather on Sunday, the sun shone brightly overhead, casting ripples of light into Halifax's world-famous harbour. It was a pleasant sight for cruise passengers Lee and Daniel Boulanger of Connecticut, who said the diversion wasn't an issue for them. Even though they were looking forward to balmy Bermuda weather, Lee Boulanger said she trusts the cruise line's decision to head north instead to avoid the hurricane, which is expected to track near Bermuda and portions of the U.S. as it gathers strength this week. "We're really glad they made the call. They're the experts, they know what the ship can handle," she said. "We would've been on a very unpleasant cruise if we were headed south." "We're both pilots, we understand weather and safety, so we're completely okay with the change of plans." Although her husband is originally from Canada, neither of them had ever been to Nova Scotia, so Lee Boulanger said they were excited to take in a new experience. "We're here to enjoy places we're never been before," she said. Daniel Boulanger added: "It's a very nice alternative. We're going to make the most of it." Norwegian Dawn was originally supposed to spend seven days on a round trip from Boston to Bermuda, but it swept into Halifax on Sunday morning. A cruise ship destined for Bermuda was rerouted to Atlantic Canada because of Hurricane Florence.